In the Great Chicago Fire of 1871, most of the area between the river and the lake was destroyed. Decades were spent rebuilding the area and central business district. Through the first half of the 20th century, River North was a busy but grimy industrial district once known as “Smokey Hollow”. After World War II, manufacturing declined and factories closed or were converted into warehouses. By the mid-1970’s, much of the area had become an urban wasteland with many neglected or abandoned buildings. Then in the late 1980’s, the revival began. Low real estate prices and large spaces attracted artists and entrepreneurs. Beautiful old timber and masonry buildings were rehabbed into galleries, studios, offices, apartments and retail stores. Attorneys, architects, ad agencies and design firms moved in, followed by hotels, restaurants and clubs. Today, River North has the highest concentration of restaurants and entertainment venues in the city. It is the epicenter of tourism, hospitality, business innovation and some of the most desirable residential real estate in all of Chicago. It is home to the largest number of art galleries outside of Manhattan and is the city’s fastest growing residential neighborhood. We have organized community initiatives and volunteers in broad categories that include development/environment, Montgomery Ward Park, pet owners, philanthropy and public safety. 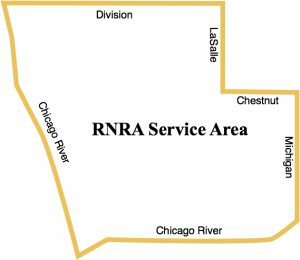 RNRA adds value to your River North investment through our leadership and advocacy efforts.